This post is filed under Frozen, Heath, Ice Cream, Klondike, Toffee. I’ve had these before. They’re soooo good. But I agree, they are big. Try the Reeses one sometime. It is greatness. 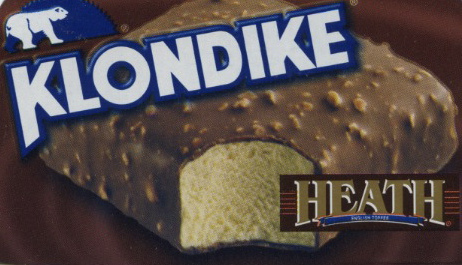 Klondike has definitely made the bars thinner in recent years. Look at the advertisement, that looks like a nice, thick and substantial ice cream sandwich. 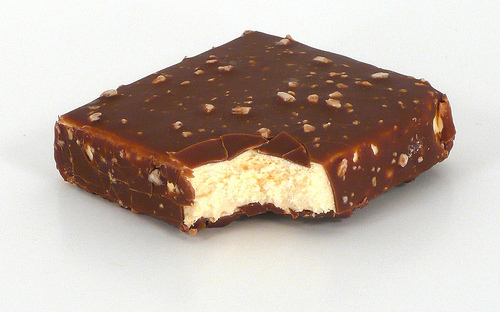 The one in real life has a flimsy chocolate coating and the ice cream is actually quite thin. I call foul on the Klondike makers.